This dog-friendly 1 bedroom condo at the Woodbridge Complex is located at the West end of Main Street and convenient to the main activities that the Rocky Mountains of Colorado have to offer. For the summer, the Summit County Rec Path runs right behind the building. Ten Mile Creek runs right below the deck and offers a view of kayakers during the spring and summer months. The building features a common parking garage underneath as well as extra parking in front, common area hot tub, sauna and laundry facilities and the free Summit Stage shuttle stop right in front of the building. This particular shuttle stop (heading west) is the last stop on the route before arriving at Copper Mountain. Woodbridge is an easy walk to the heart of Main Street - and all of the shops and restaurants it has to offer. The Silverthorne Outlet shops are only a short 4 mile drive to great stores. Unit 215A has 1 bedroom and 1 bathroom. The king size bed is outfitted with a plush mattress topper for added comfort. A summer 2014 remodel of the fully equipped kitchen and master bath add a bit of luxury to a value priced rental. Flat screen TVs with digital cable are also included. Private wireless internet and large deck complete with gas grill off the back of the unit make this a perfect place to cook out and enjoy the end of the day after a hike or a bike ride on the Rec Path. A gas fireplace in the living room is perfect for the cool nights of summer or after skiing to warm up! Lastly, this unit is PET FRIENDLY so bring Fido along with you (dogs only, 1 dog under 45 lbs please). Special courtesy rules apply to pet owners. Looking for an extra bedroom? This condo has a lock-off studio option available (depending on availability) outfitted with queen bed, futon, private bathroom, mini fridge, microwave and coffee maker. Frisco is a quaint, historic mining town with great dining and shopping opportunities, and is centrally located in the heart of Summit County; with direct access to Breckenridge, Copper Mountain, Keystone, A-Basin, Beaver Creek, Loveland, and Vail. 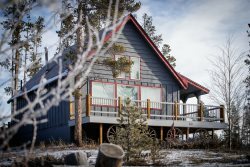 Guests have all the amenities needed to relax and enjoy throughout their mountain vacation in the clubhouse that offers an indoor hot tub, sauna, and laundry room. This home is in close proximity to the highway and Ten Mile Creek. The Summit County Rec Path is right behind the building. 1 dog under 45 pounds is allowed in the unit. Guest is responsible for bringing their own crate. I spoke with them over the phone and someone always answered and was very helpful.